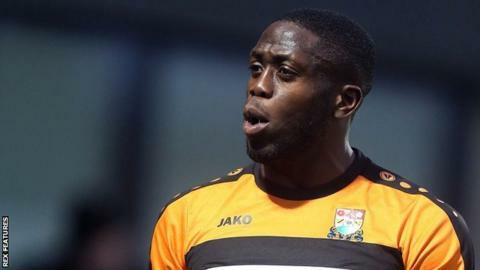 Barnet beat 10-man Newport County in League Two thanks to a second-half brace from John Akinde at The Hive. The game's crucial moment saw Newport's Medy Elito sent off for a foul on Aaron McLean in the area and Akinde rolled into the bottom corner from the spot. Barnet keeper Ian Lawlor saved a Scott Boden header as the visitors searched for an equaliser. Akinde tapped into an empty net after a defensive mistake from Newport in the closing stages to make the points safe. Victory saw the Bees secure back-to-back league wins for the first time since October and avenge their 1-0 FA Cup second-round loss at home to Newport on 5 December. "It was a good result, it was nice for the supporters to see us play so well again. "After they beat us here quite comfortably a few weeks ago, there's been a significant improvement in our play and I've got to say I was delighted with the players and really pleased for the supporters. "The players have looked much more confident, much more comfortable in possession and out of possession." "I think it (the sending-off) was a diabolical decision. I don't know what he has given it for. "The referee has changed the game with that decision. It's ridiculous. "We had four or five really good chances. Even when we went down to 10 men, we had a go. I can't fault the lads' effort. "There was no danger of us losing the game if he (the referee) hadn't given that decision." Match ends, Barnet 2, Newport County 0. Second Half ends, Barnet 2, Newport County 0. Attempt saved. Aaron Collins (Newport County) right footed shot from the centre of the box is saved in the centre of the goal. Attempt missed. Mark Byrne (Newport County) header from the centre of the box is close, but misses to the left. Substitution, Barnet. Kevin Lisbie replaces John Akinde. Luke Gambin (Barnet) wins a free kick in the defensive half. Foul by Scott Bennett (Newport County). Substitution, Barnet. Harry Taylor replaces Curtis Weston. Goal! Barnet 2, Newport County 0. John Akinde (Barnet) right footed shot from the centre of the box to the centre of the goal. Assisted by Gavin Hoyte. Gavin Hoyte (Barnet) wins a free kick in the defensive half. Attempt blocked. Scott Barrow (Newport County) right footed shot from outside the box is blocked. Attempt saved. Andrew Hughes (Newport County) header from the left side of the six yard box is saved in the bottom left corner. Corner, Newport County. Conceded by Bondz N'Gala. Attempt missed. John Akinde (Barnet) right footed shot from the centre of the box is close, but misses to the right. Attempt missed. Andrew Hughes (Newport County) header from the centre of the box is close, but misses to the left. Corner, Newport County. Conceded by Bira Dembélé. Attempt saved. Sam Togwell (Barnet) left footed shot from outside the box is saved in the top centre of the goal. Attempt saved. Aaron McLean (Barnet) header from the centre of the box is saved in the top centre of the goal. Substitution, Newport County. Aaron Collins replaces Tommy O'Sullivan. Foul by Tommy O'Sullivan (Newport County). Attempt saved. Scott Boden (Newport County) header from the centre of the box is saved in the top centre of the goal. Mark Byrne (Newport County) wins a free kick in the defensive half. Attempt missed. Tommy O'Sullivan (Newport County) right footed shot from outside the box misses to the right. John Akinde (Barnet) is shown the yellow card for a bad foul. Mark Byrne (Newport County) wins a free kick in the attacking half. Attempt missed. Mark Byrne (Newport County) right footed shot from outside the box misses to the right. Substitution, Newport County. Scott Barrow replaces Jazzi Barnum-Bobb. Mark Byrne (Newport County) wins a free kick on the left wing. Foul by Bira Dembélé (Barnet). (Newport County) wins a free kick in the attacking half. Corner, Barnet. Conceded by Joe Day. Corner, Barnet. Conceded by Tommy O'Sullivan. Attempt missed. Lenell John-Lewis (Newport County) right footed shot from outside the box is just a bit too high.